This is a dense, rounded tree with dark green leaves that emerge lighter green in spring. The foliage is not susceptible to leaf scorch. The palm-shaped leaves turn yellow in the fall. 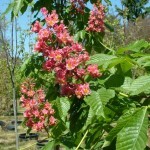 Showy spikes of dark pink flowers with yellow eyes emerge in spring. Prefers full sun to part shade in well-drained soil. It was selected at the fort with the same name in Washington, D.C.